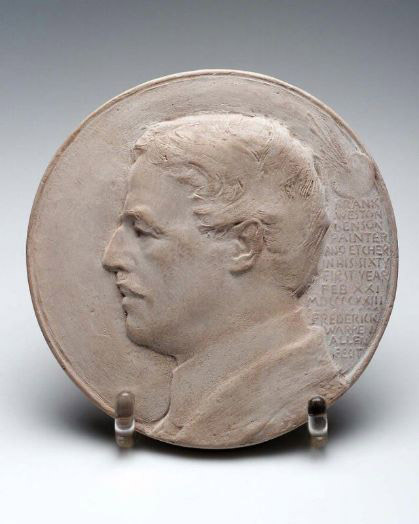 This bas relief of Allen’s colleague Frank W. Benson (1862 – 1951) was an affectionate tribute to his friend. They lived within a mile of each other in North Haven where they were part of the Bartlett’s Harbor Artists’ Colony. They taught at the same time at the Museum School, created art according to the Boston School tenets and embraced an impressionistic treatment in much of their work. The subtly tinted plaster portrait was a gift of the Barbarossa family to the Museum of Fine Arts. The museum copy was the first cast, from which two additional bronze casts were made. F.W.Allen’s skill in creating such definition in such low relief is remarkable. As a student of Bela L. Pratt with a numismatic legacy passed down from Augustus Saint-Gaudens, both of whom were famous for their coin work, it’s not surprising that he could accomplish this, but without the gift Allen possessed, this would not be such an excellent work of art. Benson was one of the Masters of the Boston School of painters and a regular exhibitor at the Guild of Boston Artists. He taught at the School of the Museum of Fine Arts for many years and influenced generations of painters after him. His retirement from his teaching post came during the upset over policy and ideological changes at the school. Allen was asked by Benson to read his retirement letter to the Council, and continued his association as a guest teacher. Allen remained on as an instructor. They both summered in North Haven, Maine as members of the bohemian North Haven Artists’ Colony. Benson’s beautiful “Shimmering Sea” was painted at Bartlett’s Harbor, the view appearing to be from Bela Pratt’s front yard next to the Allen cottage and Allen sculpted an unusual Mermaid for Benson’s flower garden there at Wooster Farm on North Haven. Allen’s grandson now owns the Benson property. Benson was a leader in the Boston cultural community and a friend of Frederick Allen. Two bronze copies of this medallion were made, one for Frank and one for another unnamed person in North Haven. In 1923, Frank invited Frederick to do a two-man show at the Minneapolis Museum where his portrait was exhibited. Allen made use of a feature typified by Augustus St. Gaudens, that of including an inscription and a symbol of the person within the border of his portraits. Here there is an artist’s palette and brushes behind Benson’s head above the identifying text The inscription reads, “Frank Weston Benson, painter and etcher in his sixty first year” followed by his dates and Allen’s signature. St. Gaudens also regularly brought the viewer into his portraits by bringing the elements out over the borders or frame surrounding it. Note the palette and the artists’ shoulder designed using the same treatment. Another technique was employing a textured ground against the smooth elements in the center of the portrait. Note here the cross-hatched combing around the perimeter, the fine texture of Benson’s hair, the depth of the lights and shadows in very low relief, the contrast between the smooth face and collar juxtaposed with the textural contrasts of the surrounding details of the rough coat, the lettering, the hair and the and edge detail. Note also the accuracy of the portrayal, both in appearance and in personality. Provenance: Clay original sold through dealers and lost in Maine, Bronze cast owned by Frank W Benson, second bronze (missing) reported to have been in North Haven. Plaster owned by Theodore C. Barbarossa, inherited by his daughter Susan G.Barbarossa who gave it to the Museum.